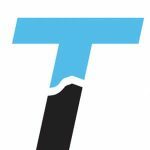 The Truckee Donner Land Trust has announced a new campaign to purchase Frog Lake and neighboring parcels, which would open up the pristine lake and surrounding landscapes to the public in 2020. 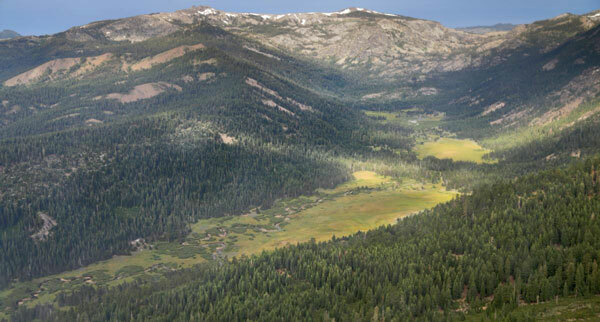 Working with The Trust for Public Land and The Nature Conservancy under the Northern Sierra Partnership, the capital campaign is now underway, according to a press release. Until these acquisitions are complete, the Land Trust asks that members of the public respect the current owners’ private property. Hikers can get a glimpse of Frog Lake from the top of Frog Lake Cliffs by taking the Warren Lake Trail. 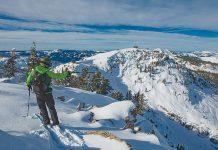 Totaling 2,914 acres, the properties are north of Interstate 80 and east of the Sierra Crest, falling between Castle Peak to the west and Tahoe Donner’s Euer Valley to the east. Frog Lake, owned by the Smith family since the 1930s, has been closed to the public for nearly a century, preserving a beautiful landscape including the lake itself at 7,600 feet, Frog Lake Cliffs, late seral forests and key habitat for numerous species. The other acreage, currently owned by Sierra Pacific Industries, includes Red Mountain on the ridge between Euer Valley and Carpenter Valley. These parcels link Frog Lake to other Land Trust acquisitions including Lower Carpenter Valley, Independence Lake, Perazzo Meadows, Webber Falls, Webber Lake and Lacey Meadows. 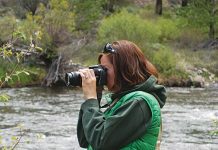 That connection is critical, creating contiguous land management, providing threatened and endangered species with connected habitat and protecting the upper watersheds of the middle stretch of the Truckee River. It protects upland water sources for the rare and delicate fens of Carpenter Valley, and is home to species like black bear, marten, mountain lion and northern goshawk. The Land Trust and its partners have taken on the lofty goal of raising $15 million to acquire the property by 2020, at which point the property will be open to the public. 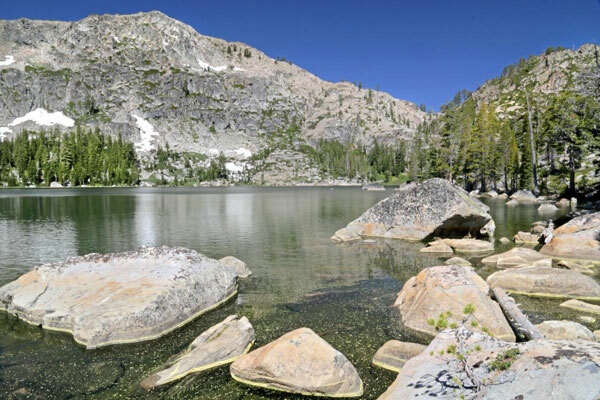 Trails are planned to not only give visitors access to Frog Lake and the Carpenter Valley ridges, but also to connect other preserved properties, opening up huge swaths of the Northern Sierra previously unavailable to the public. Access will be for non-motorized use only, and back-country skiing, snowboarding and snowshoeing will be excellent in the winter months. An historic stone lodge, built for the Smith family, may become a winter back-country hut, part of larger plans in the works for a hut system in the region. The Frog Lake property was acquired by the late Felix Smith from the Southern Pacific Railroad in the 1930s, and it has been a summer retreat for the family since. The family has been a great steward of this extraordinary property, and with this commitment to Truckee Donner Land Trust, they have now achieved their goal to ensure it goes to conservation. While the property won’t be open to the public for two years as the Land Trust and its partners raise the funds required to complete the transaction, hikes can enjoy the aerial view of this gem from above using the Warren Lake Trail. 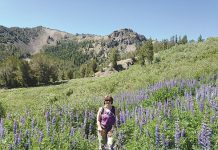 The Warren Lake Trail starts at the Intersection of the Summit Lake Trail and the Donner Lake Rim Trail on Donner Summit, accessible by the Pacific Crest Trail or from the Castle Valley Trailhead. Parking is available at the Castle Peak exit off Highway 80. This popular trailhead was protected from development in 2016 allowing continued public access to the Pacific Crest Trail, Castle Peak and the popular Hole in the Ground mountain biking Trail. A trail kiosk at the end of the paved road directs hikers to the Donner Lake Rim Trail. Follow the trail east behind the Donner Summit Rest Area toward Summit Lake. You’ll encounter a well-signed intersection with the Warren Lake trail east of the Rest Area before Summit Lake. From parking to Frog Lake Cliff via the Donner Lake Rim Trail and Warren Lake Trail is about 3 miles, gaining roughly 1,400 feet in elevation through mature mixed conifer forest replete with regular views east. A short unsigned spur trail to the top of Frog Lake Cliff will be evident at a high, open point. Follow that spur and your climb will be rewarded not only with sweeping views of Frog Lake more than 1,000 feet below, but also Euer Valley and the surrounding peaks.